Conceivably there may be more important matters arising in Korea just now. In the countdown to the Kentucky Derby, however, one horse raises two questions that make the peninsula a theatre only of the most wholesome kind of international rivalry. The first is whether Bode Miller - if something of a part-time skier, nowadays, ever a full-time dude - can return from injury at the age of 40 to seek a seventh Olympic medal at the Pyeongchang Winter Games next year. And the second is whether he can meanwhile scale new sporting heights through a colt from the sole American crop of Hansen, who was exported to South Korea in 2013. Miller has lived as he has skied, on the edge, and so transcended the kind of dull obsession that confines so many other elite athletes. In recent years his inquiring and adventurous mind has been increasingly intrigued by thoroughbreds, and a few days ago he bought a stake in Kentucky Derby contender Fast And Accurate. On the face of it, the son of Hansen is no less a longshot than his new part-owner must be for a second Olympic gold. After all, he’s a Pennyslvania-bred who had to drop to a $30,000 claimer to break his maiden on his fourth juvenile start. But after a winning reappearance on turf at Gulfstream, last month he produced startling improvement for trainer Mike Maker to win the $500,000 Grade 3 Spiral Stakes, on the synthetic at Turfway, at 24-1. 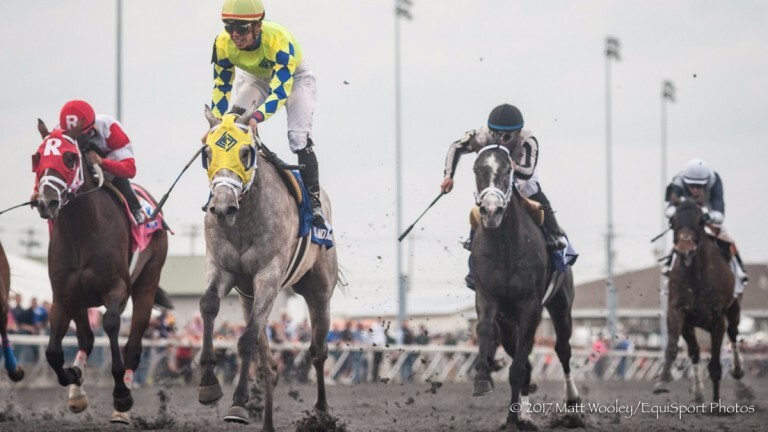 He did so in the silks of the locally based Dr Kendall Hansen, who campaigned the horse’s sire - and, with typical freedom from inhibition, his own namesake - to be champion juvenile in 2011 and finish ninth in the Kentucky Derby, likewise trained by Maker. Hansen, the horse, at that time introduced the racing community to a highly extrovert character in Hansen, the owner, a pain management specialist and former professional punter - not least in attempting to run the near-white colt in the Blue Grass Stakes with his tail dyed blue. Dr Hansen did not disappoint after the Spiral, kissing the ground in the winner’s circle and vowing to pay the $200,000 required to supplement Fast And Accurate to Churchill Downs tomorrow week. Miller, already co-owner of another Hansen colt who had set the early pace in the Spiral, has since emerged among a number of new investors in the colt. Fast And Accurate was bred during Hansen’s fleeting sojourn at Ashford in Kentucky, after which he was recruited by the Korean Racing Authority to stand on Jeju, a volcanic island off the south of the peninsula. The progress of the KRA breeding programme could be measured last year when a son of an earlier import, Peace Rules, finished third to California Chrome in his World Cup warm-up at the Dubai Carnival. After initially prospecting Australia and New Zealand for upgrading stock, the KRA recognised that American blood would prove better suited to its sand tracks at Busan and Seoul. The Harlan stallion Menifee, runner-up in the 1999 Kentucky Derby, has proved a prolific success since his arrival in 2007. Hansen subsequently joined a roster of ten to a dozen KRA stallions, between them responsible for around half an annual foal crop of 1,300-1,400. To be fair, his eligibility for a stud career in his own homeland had not been unquestioned. In his favour was a bright start by Tapit, who had produced an aptly named Breeders’ Cup Juvenile Fillies winner from his first crop in Stardom Bound; not to mention Hansen’s own precocity, speed and attractive build. Nonetheless, in struggling to stem the costs of a divorce, Dr Hansen gave her away to a member of the Churchill Downs starting crew named Curtis Disbro. By that stage she had produced two foals by Tapit - and even the most squeamish of the Bluegrass establishment must credit Dr Hansen’s acuity on getting aboard with the future champion (and $300,000 cover) at just $12,500. Her second foal, on entering training, proved such a handful that one day he ripped a watch off Disbro at the gate. When the youngster won a sprint maiden by 12 lengths, inevitably at Turfway, Dr Hansen duly added a Tommy Hilfiger watch to the $10,000 he paid Disbro to recover the mare. Hansen proceeded to win his next start by a similar margin and then the Breeders’ Cup Juvenile itself, making all and just holding out from Union Rags. But he never seemed terribly likely to carry his gung-ho speed through Classic distances and his sophomore campaign was largely spent proving as much, notably when falling in a hole after going clear in the Blue Grass and again when fading in the stretch in the Kentucky Derby itself. After Hansen suffered a tendon injury, Ashford took a punt on the horse - the third of four consecutive champion juveniles to join their roster - and managed to book him 147 mares at $12,500. Dr Hansen bred or co-bred 37 of 102 registered Ashford foals by his eponymous champion, and remained eager to support him after his exile. He duly purchased Fast And Accurate for $85,000 at the OBS April breeze-ups last year, hoping to target state-bred confined prizes. But he came away with rather more than he bargained for in this son of It’s Heidi’s Dance, a Green Dancer mare who has produced six winners from six starters (one stakes-placed, albeit in Peru). It’s Heidi’s Dance herself failed to win and changed hands for just $8,000 at the Keeneland November Sales in 2005. But she shares a Halo dam - Shahalo, unplaced in two starts - with three Graded stakes winners, two of sufficient distinction to be at stud. Shahalo’s son by Holy Bull, Bwana Bull, meanwhile won the Grade 3 El Camino Real Derby in 2007 but never got involved as a 50-1 shot behind Street Sense in the Kentucky Derby itself. That might seem a likely fate for Fast And Accurate, too, but he does graduate from the same Derby trial as Animal Kingdom (2011, when also a dirt maiden) and Lil E Tee (1992). And, whatever happens on raceday, he brings some authentic stardust to Louisville in Miller. In Hansen’s year, remember, not even he could lie up with the trailblazer - who very nearly lasted home, too, only run down late by I’ll Have Another. That was Bodemeister, who owed his name to the one chosen by trainer Bob Baffert for his son after watching a young Bode Miller cut such a dash at the Salt Lake Olympics of 2002. Baffert and Miller became fast friends, while Bodemeister now has a Derby contender of his own from his first crop, in Always Dreaming. So who will leave the most lasting imprint on the Turf, in this story of names transposed between men and horses? Hansen or Bodemeister? Dr Hansen, who is not holding back about Coolmore’s deal with Korea? Or maybe his new partner in Fast And Accurate? Miller owns a barn at the Fair Hill training centre in Maryland, has recently dipped his toe into the stallion business in Pennsylvania, and has even spoken of training thoroughbreds himself some day. He views the industry’s standardised regimes as being roughly equivalent to physiological monitoring of the human athlete in the 1950s, and downright inimical to maximising a horse’s potential. To a man accustomed to dealing in hundredths of a second, it is hardly surprising if some of the old horse lore strikes him as clumsy. But if he thinks we can become more accurate, for now his new horse will just have to be fast.